On the fourth day of the Jeevan Adhikar-Sanghrash Yatra, Narmada valley reverberated with the slogan “Modi-Shivraj Go Back” – “Hamare Gaon me Hamaara Raj, Vaapis Jao Modi Shivraj”. The slogan coincided with the Shaheed Divas and the Quit India Day against the British Raj. Pointing out they have already gone back on their poll promises and constitutional-legal obligations, the people called upon the Modi-Shivraj duo to also “Go Back” andQuit Narmada. 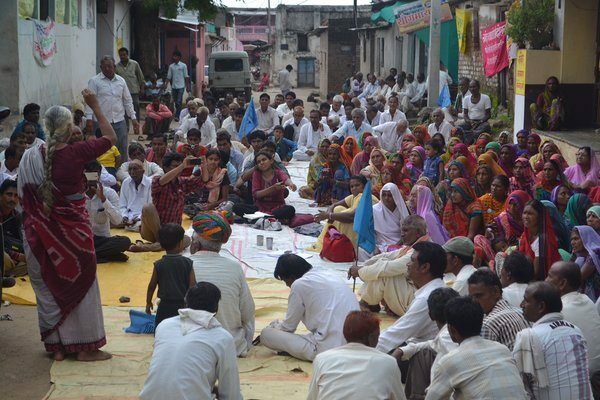 The yatris asserted the rights of the Gram Sabhas in the scheduled adivasi areas and questioned the unlawful-inhuman decisions of the Central and State Governments to submerge 245 villages for the Sardar Sarovar Project. Adivasis, Mankar and oustees of various communities, young and old, men and women sang and danced together to the sound of drum beats in village after village. Remembering Tantya Mama, Khaja Naik, Bhima Naik and other adivasi heroes whose valorous struggles, kept the Nimad region and hilly areas out of the clutches of the British rule, on theAdivasi Rights Day, adivasis and activists unitedly stated that time has come to wage a new war of independence against the brutal Indian State which has decided to massacre 2.5 lakh people without rehabilitation, prioritizing benefits of the dam to corporates who have funded the elections of the ruling party. Farmers entangled in the fake registries scam under inquiry by the Jst. Jha Commission, farmers who received one installment of cash, but could not purchase land, farmers given uncultivable land from the land bank – all of them –more than 6,000 eligible farmer-oustees demanded “land for land” and asserted “No Gates, If No Land”. Landless families and fish workers, who number in thousands in the Narmada valley, demanded sustainable alternative livelihood, scoffing at the meagre cash grants and challenging the unlawful submergence. Addressing hundreds of villages at every village-meeting, Medha Patkar stated that the struggle is not just for the 2.5 lakh people, but to preserve the most ancient civilization, the most fertile lands-agriculture, an entire river valley, to save the history and future from destruction, whether by dams, canals or sand mining. She wrote an Open Letter to the Prime Minister, calling him to convey his Mann ki baat on the realities of Sardar Sarovar, which was read out and endorsed by all Yatris in Village Semalda. Drawing a poetic parallel between Uttarakhand and Kedarnath disasters, Pannalal, Village Kavthi warned people of the impending catastrophe due to the cascade of dams on the Narmada and called for a unified struggle. The Yatra passed through the villages of Ekalvara, Acchoda, Semalda in Tehsil Manavar today where the oustees challenged the fraudulent back water figures and surveys of the NCA and NVDA. While numerous villages are to go under dam waters, many hamlets are also doomed to become (tapu) marooned, but neither are there any arrangements for rehabilitation nor exit roads / bridges etc. Oustees at the resettlement sites of Perkhad and Sharikpura recounted thesevere difficulties of lack of water, electricity, water troughs, drainage, livelihood sources, grazing land, water accumulation in house plots, even expressing regret over shifting to the sites and a desire to go back to the original villages! The Yatris shall cross over the river Narmada from Semalda and reach Village Chhota Barda in Badwani District tonight. The struggle for survival continues…..